It would be difficult to grow up with the affluence that permeates life in North America, particularly as presented on TV and in the movies, without at least once wondering what it might be like to live aboard one of the many superyachts sprinkled throughout the harbours of our nation, a yacht upon which you could invite family and friends and where you would most certainly meet others from the four corners of the earth? Ah, it could happen to you and could happen soon. 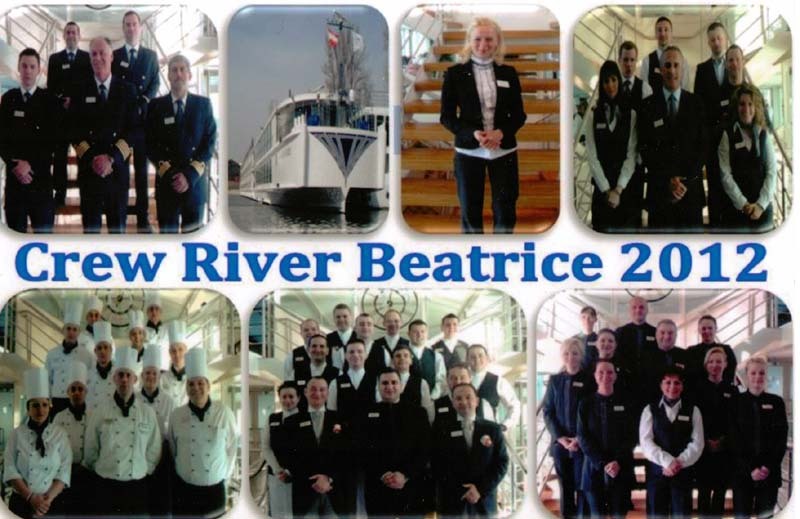 On board the River Beatrice, you will be presented with the finest cuisine, choice wines and entertainment representative of the cities and countries through which you will travel. 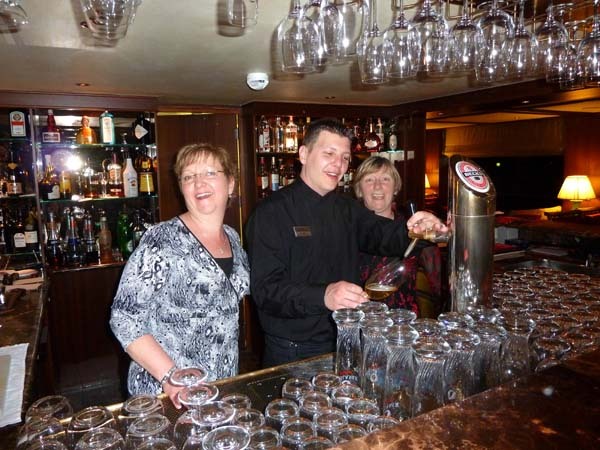 You will be hosted both by a knowledgeable, friendly onboard crew and by others just a just short, chauffeured ride away in local restaurants, wineries, theatre or tourist attractions. At each stop, you receive preferred entrance and VIP treatment. 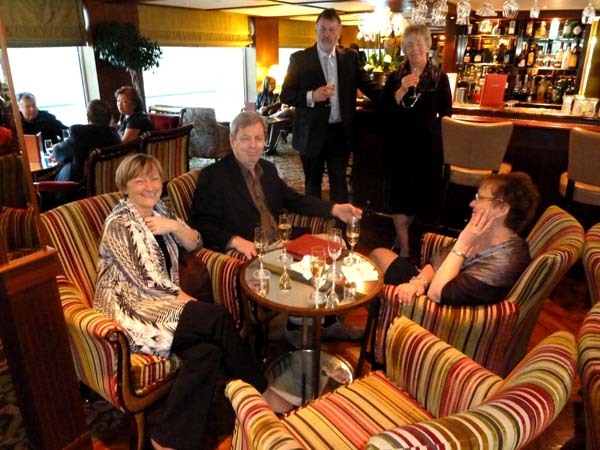 For most this would be no more than an idle dream, but in the new world of ‘boutique’ river cruising, it is no longer the exclusive domain of celebrities or the super-rich. 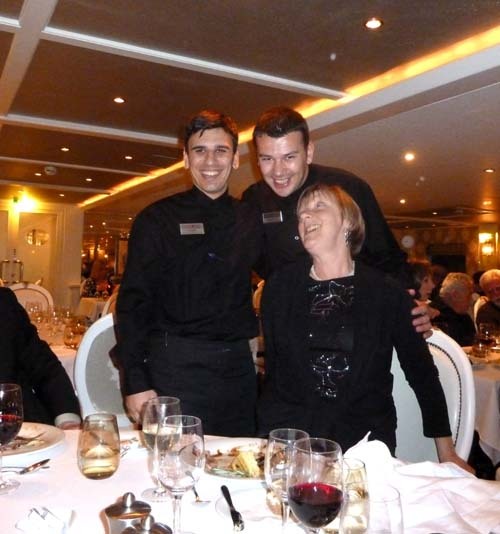 From the moment we boarded the River Beatrice in Budapest, we knew this cruise would bring special memories not only of the countries we would visit and the extraordinary sights we would see but, and most importantly, the people we would meet along the way. While the more expensive staterooms provided premium services and extra space, even in the least expensive, passengers received first class treatment. 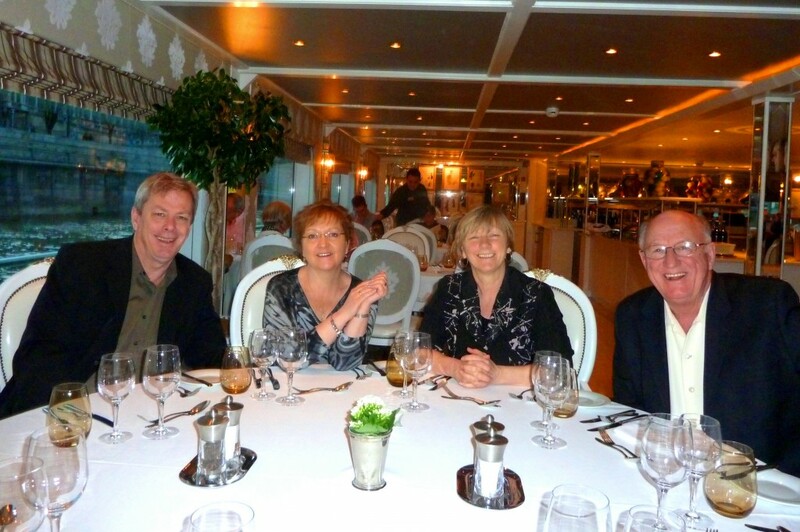 The dining room and two lounges (one forward and smaller aft) provided an elegant, but comfortable atmosphere. Photo (hdm): Lynn relaxes in our spacious, well-appointed room on the upper deck. A sliding glass door opened to an outer railing on which one could lean to savour the passing scenery. What was also soon to become evident, and which was to make every aspect of our trip so very special, was not only the professionalism but also down-home courtesy of the men and women of the crew. Under the gentle guidance of Captain Tom, a master mariner descended from four generations of Dutch Seaman, it was clear that Uniworld, a family owned and operated a company of more than 50 years standing, has made customer satisfaction a core value. What was equally clear, was that the service provided was not just a matter of company policy, it flowed from the hearts and minds of the men and women crewing the ship. Onshore, tour guides from local communities added immensely to the flavour as they sought to pull away from the veneer of ‘tourism’ by providing a friendly, informative look at the place they called home. This included both the good and the bad. With plenty of opportunities to walk the streets on our own, we found the citizens and business persons, young and old, with whom we shared a coffee or a meal, to be equally cheerful and helpful. 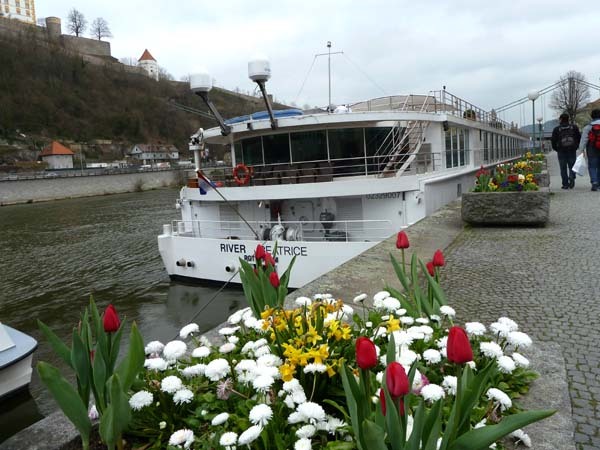 The following photographs provide just a few examples of our experience while traveling along the Danube on the River Beatrice. 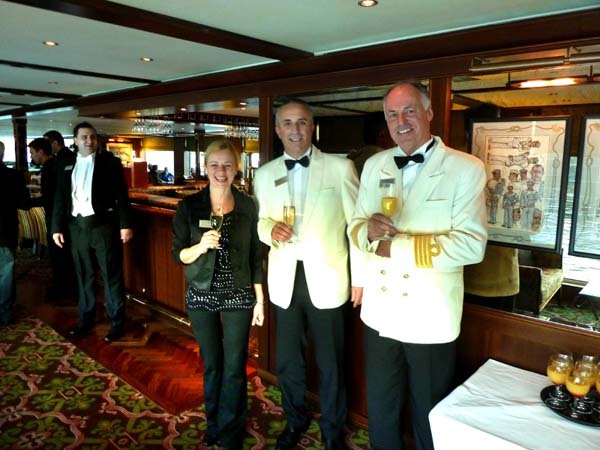 Photo (hdm): Captain Tom Buining, Hotel Manager Mario Mirao and the effervescent Cruise Manager, Mirela Varga, greet passenger with a glass Champaign. Each evening during the cocktail hour in the lounge that preceded dinner, Mirela provided everyone with an outline of our itinerary for the following day. 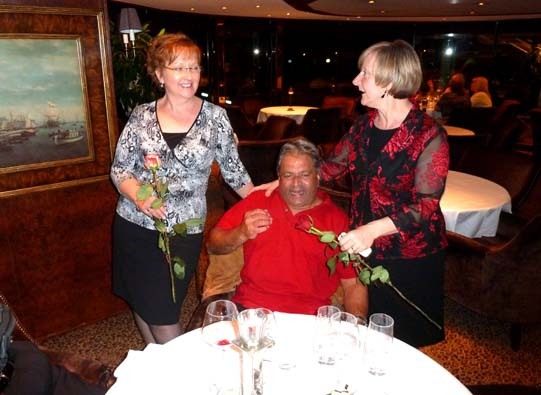 The relaxed atmosphere on board was exemplified by the Captain as he was often available for a photograph and a few words about his seafaring experience. From a family of mariners, he clearly loved his job within the Uniworld family. With a crew of nearly fifty plus an additional ten or twelve tour guides on shore, each of the 120 passengers were certainly provided with attentive service. 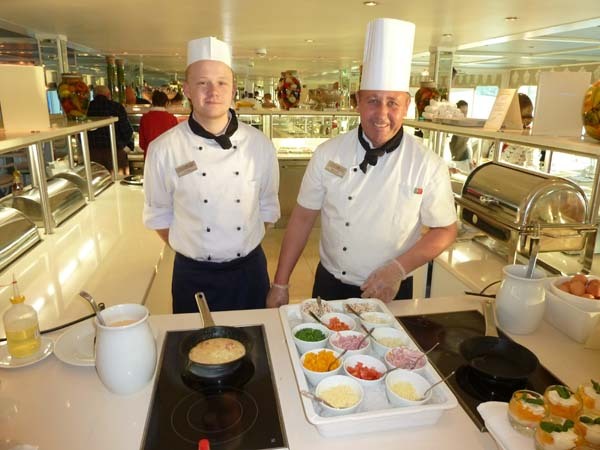 Meals would be provided in your cabin if you so wished and coffee service was available 24 hours a day. The lounge would remain open until the last guest decided it was time to retire. This usually included Lynn and Esther. 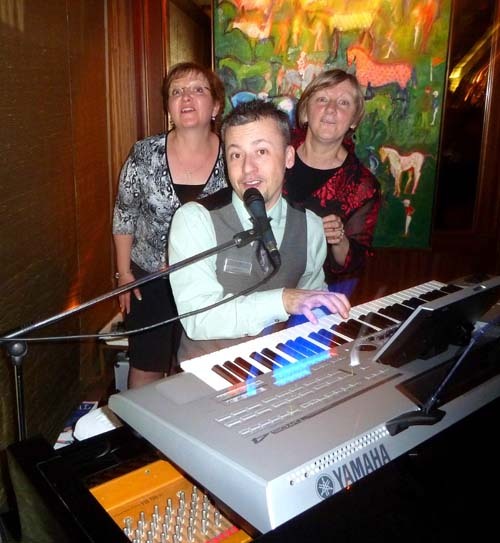 It never possible to get Lynn up singing at home, but match her up with Esther and throw in a little of the upbeat nightly music provided by Zoltan, and she was off and running. What is your pleasure gentlemen? As Garth and I can attest, there is nothing better than being on good terms with the bartenders. 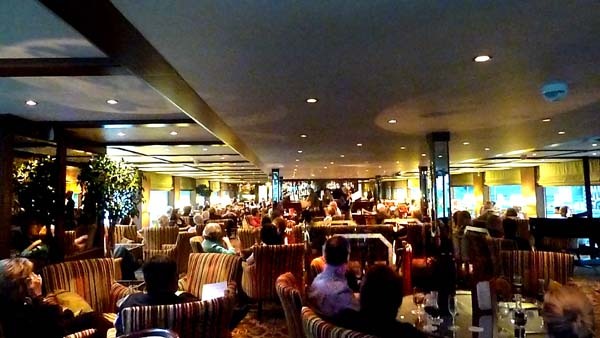 With nightly music, drink and entertainment the lounge was always a popular place to wind down after a hard day checking out the local tourist hot spots along the Danube. One of the very neat things about a river cruise is always having your hotel room accompany you to the next stop in your travels. In a little less than three weeks (Seatle to Europe and return) we only changed hotels (River Beatrice being our floating oasis) four times, including the two overnights at a Best Western in Seatle. We honestly thought Elvis was dead, but we found out he was alive and living in Australia with his wife. He joined the River Beatrice and his secret remained until one day Esther and Lynn smoked him out. Here they ply him with roses as a touching symbol of their eternal love of his music. Lynn and a couple of admirers. It was a short hop from the bar to the dance floor as we nailed our favorite spot. These friendly smiles greeted passengers every morning and by the second day these gentlemen knew many of the personal preferences of many. With all the late nights in the lounge, it was a good thing someone remembered what we liked in the morning. Each morning we would find the River Beatrice snuggled up to a jetty in a new city or town from which point we would be off on a new adventure. Agreed…Truly wonderful company and staff!! What great memories. Lynn we were all such Dancing Queens. I tried to email you Lynn but the email address on Helene’s form did not work. Please send me your email address. 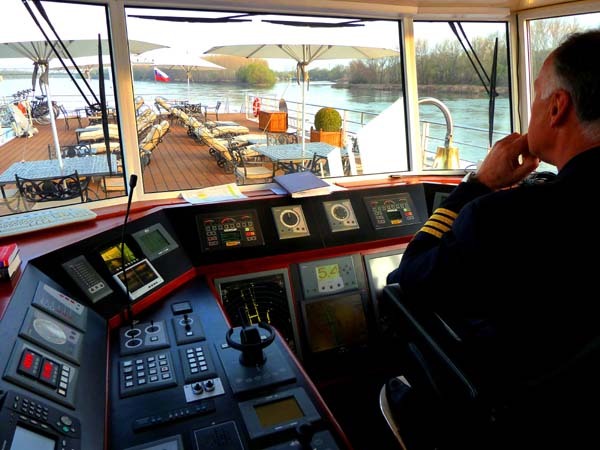 Yes, I’m glad that you had a wonderful trip aboard River Beatrice, and always appreciate the effort of the crew, paying a tip, but what a shame that this hotel manager Mario ,always can not refrain from stealing tips money, that your entire work crew rewarded !!! !…everybody knows this, but no one says anything for fear of losing your job !!! !….